Garnishing the Russian Tea with cinnamon sticks and orange slices would be a good idea! Image via Flickr user thedabble under a Creative Commons license. In my “nightmares before Christmas” post, I mentioned Russian Tea, which is a holiday tradition in my family. I served it at last year’s Thanksgiving Potluck, and our friends all demanded the recipe. When I announced this year’s Thanksgiving Potluck, people wanted to know if I’d be serving the Russian Tea again, pretty please please please. I should say first off that Russian Tea is not, as far as I know, actually Russian. My family is not Russian, and the roots of this recipe as far as I know them, are to vaguely English/Irish folk in rural Arkansas. My Memaw made this tea every Thanksgiving and Christmas that I remember, serving it from a big commercial-type percolator that always kept it a little too hot– I’ve scalded my tongue almost every holiday, because I can never wait for it to cool. It was only later, as an adult, that I emailed my mother for the Russian Tea recipe and learned that it was originally supposed to be spiked with booze. Which may be the real reason it goes over so well at our potlucks. So, my holiday gift to my readers, thanks to a comment from reader bluebears, is the recipe for this yummy beverage. Think of it as a spiced, citrusy cider alternative, and spike it with either dark rum or bourbon. Boil 4 cups water and steep 4 regular-sized tea bags. Add to that mixture in a large stock pot 1½ cups sugar, 2½ cups pineapple juice, 1½ cups orange juice (frozen concentrate, not diluted), 6 Tsp. fresh lemon juice, 8 whole cloves, 2 cinnamon sticks, and 8 cups water. Bring to a boil, serve warm, add dark rum or bourbon as desired. Boil 8 cups water with 8 tea bags, add 1 large can pineapple juice, 1 family size frozen OJ, and 12 Tsp. 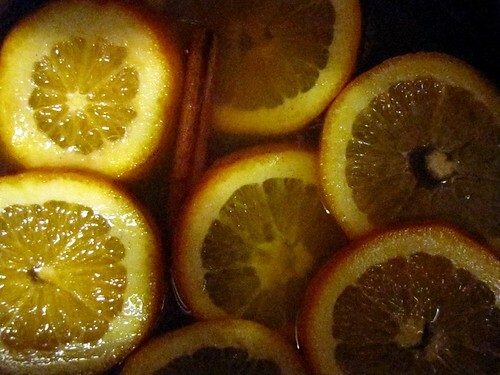 lemon juice, 2 cups sugar, 16 whole cloves, 4 cinnamon sticks, and 16 cups water. I made mine in crock pots for my potluck, which worked fine and kept it warm, but this recipe usually works best in a really large stock pot. I like to keep leftover tea in pitchers in the fridge to make individually microwaved cups throughout the holiday. Oh, and you might want to add the alcohol to each cup at time of serving to keep the uh, buzz-inducing-part, from getting cooked out. my family always made the “dry” (in more ways than one) version of this tea with tang, powdered tea, & spices. it was always placed in a small jar, wrapped with cute ribbon, & given as gifts. of course, i’m from a southern baptist teetotaler family so it was dry in terms of no booze. but i’ve had the better version of it (similar to this but no pineapple juice) with a bit of orange liqueur making it supertasty. thanks for the recipe.